A Fourth Form Friendship was first published in 1912, and features Birkwood Grange, run by the progressively minded Miss Drummond, which is one of these “up-to-date” schools: “If there's any jolly thing that it's possible to do Miss Drummond thinks of it.” Aldred Laurence is an attractive ordinary fourteen-year-old girl who is both clever and ambitious. When she becomes a new girl at Birkwood Grange, she is determined to win popularity at any costs and makes friends with Mabel Farrington who has a great following at Birkwood Grange, partly because of her appealing personality, and partly because of her impeccable family connections. 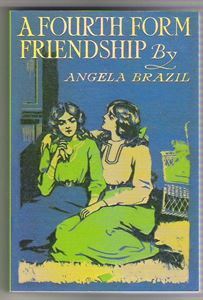 Through a mistake, Aldred is credited with a brave deed which she has not performed, and fearful of losing her friendship with Mabel, she does not own up. Maintaining her reputation involves Aldred in many awkward complications. How she is led through her friendship to realise that honour is worth more than popularity, and how in the end she retrieves her character, is the purpose of A Fourth Form Friendship to chronicle. The book begins with introductory articles by Sally Dore, Mary Cadogan, Valerie Bonham and Clarissa Cridland. There is a particularly interesting publishing history, and the book also comes with a full colour frontispiece and four black and white plates.